The ice–water interface (underside of the sea ice) has the highest densities of ice algae (brown colouration) and sympagic meiofauna. The hydroid S. tuuli recorded in Svalbard was found in the lowest 3 cm. The temperatures and salinities are less extreme here since this bottom section is in close contact with the water below, which also provides “fresh” nutrients. Photo: J Søreide. In 2015, we discovered two cnidarians in the bottom 10 cm of sea ice in Van Mijenfjorden. Now, molecular analyses have confirmed our morphological identification of one of these cnidarians as the hydrozoan Sympagohydra tuuli – the first ever recorded in the Svalbard archipelago. The one specimen of Sympagohydra tuuli found in Svalbard April 2015 (from Marquardt et al. 2017). This delicate and naked hydroid is almost spherical when contracted and tubular when relaxed to its maximum length. It has four oral tentacles which can be extended to three times their length. The tips of these tentacles can be slightly orange Photos: M Marquardt. This ice-living hydroid was first discovered in Barrow (Alaska) in 2003. In 2008, it was recognized as a new species, and shortly after, it was found in both fast ice and pack ice in the Western Canadian Arctic and in the Central Arctic Ocean. 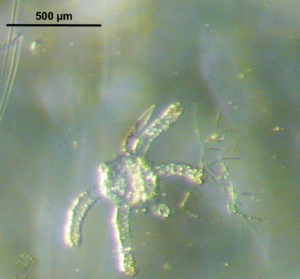 This small (0.2 to 1.1 mm) hydroid has a unique combination of characteristics that distinguish it from other known hydroids. It is therefore assigned to a new family Sympagohydridia under the hydrozoan subclass Hydroidolina, order Anthomedusae, suborder Capitata. The genus name Sympagohydra was chosen because it is an ice-associated (=sympagic) hydroid, while its specific name was in honour of Tuuli, the newborn daughter of Bodil Bluhm and Rolf Gradinger, who first discovered this species. Bodil and Rolf recently moved to Tromsø where they work as professors at UiT The Arctic University of Norway. This is very fortunate for the Fram Centre institutions and today UiT, UNIS, the Norwegian Polar Institute and Akvaplan-niva collaborate closely to expand knowledge on sea ice meiofauna in the European Arctic. 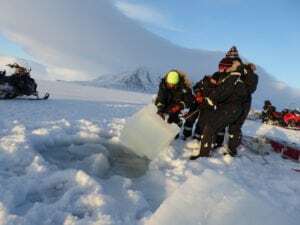 Every year UNIS takes students to Van Mijenfjorden to sample physical and biological parameters of sea ice and the water below as part of the bachelor course AB-202 Marine Arctic Biology. 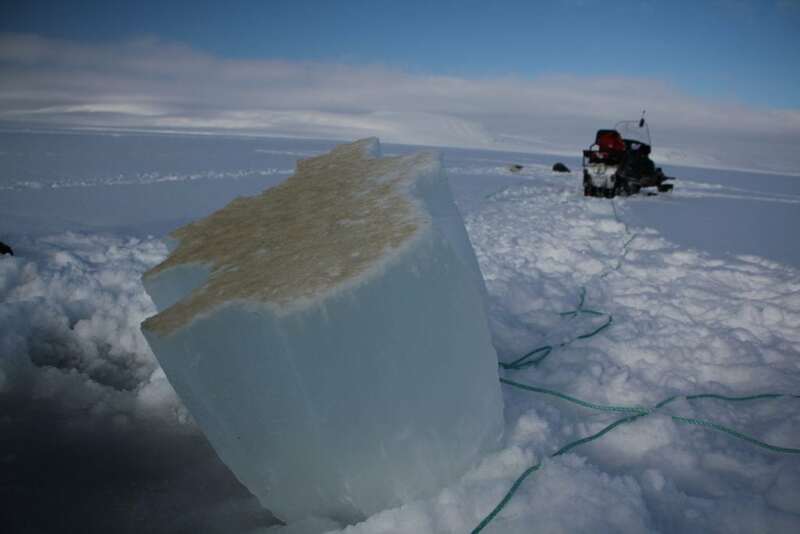 Here we see students making a hole in sea ice in 2015, when the small hydroid S. tuuli was found for the first time in sea ice in Svalbard Photo: J Søreide.